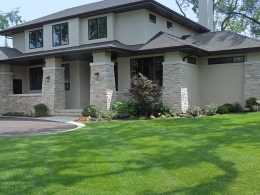 01; This new construction house had over an acre of property that included many mature trees. It was our job to merge the old with the new. The homeowners also wanted to incorporate a flow of colors and textures that would keep visitors curious as it traveled along the planting beds in the back and side yards. 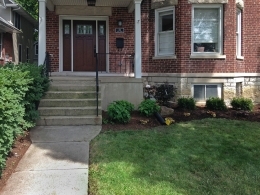 The front uses a variety of shade tolerant shrubs and conifers to create welcoming entrance regardless of season. 02; This new construction house wanted both the front and back yard to become extensions of their living space. Natural flagstone steppers and a variety of trees, shrubs and flowers were used to soften the urban feel of the neighborhood. Whether on the front patio or back patio, the homeowners are surrounded by colors and fragrances that create and sense privacy and relaxation. 03; This country home was in need of major curb appeal. We began by installing native limestone retaining walls. Then we chose an earthy flagstone to create private sitting nook and curved front entrance. 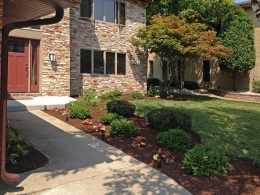 07; After an addition and remodel of the front of their house, these residence wanted a new landscape that could include some of their existing trees. We used various various colors and textures to make this an outstanding landscape through all seasons. 07; The new homeowners wanted to create a tranquil, relaxing retreat within their bustling, urban neighborhood. Existing large shrubs already provided privacy, so we infused the property with colors, textures and seasonal interest. By using drywall stone and a rustic rain barrel, an edible garden was perfectly blended into the landscape oasis. This is now the perfect retreat to socialize, barbeque or just relax. 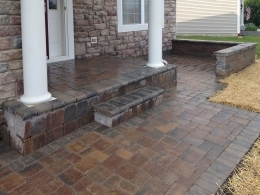 05; We installed a brick paver walkway, step and stoop. We also created a landscape design with curved, clean bed lines to give this house a distinctive appearance in the neighborhood. 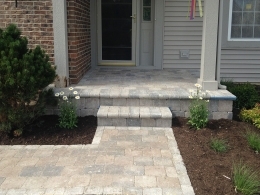 Brussel Block paver stones were used for the paver and stoop, along with a combination of Mugo Pines, River Birch and various grasses, perennials and shrubs in the front landscape. 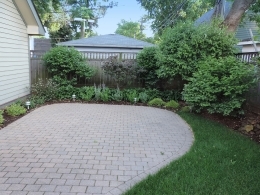 09; Hollandstone brick pavers were used to create a large back patio for sitting, eating and entertaining. Brussel Dimensional stones were used to create a seat wall for entertaining guests. 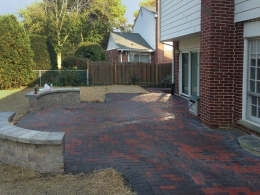 08; Brussel Block pavers and Brussel Demensional stones were used to create a front brick paver patio and seat wall. 06; A barren landscape in the Wrigleyville, Chicago area had a landscape design update that included new sod, shrubs, perennials and a dog run. 10; This family needed a place in their yard to sit and entertain. 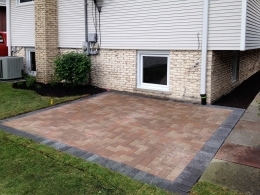 We installed a 12' x 12' brick paver patio using Hollandstone pavers. It was the perfect size for the family's outdoor dining table. Now the family is able to enjoy the outdoors with company or just have a place to relax at the end of the day. 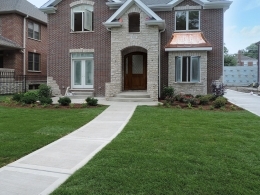 11; This historic home in Arlington Heights required an updated landscape that would be true to the houses time period. Being that it is located on a busy intersection, we had to account for pollution, salt and snow. 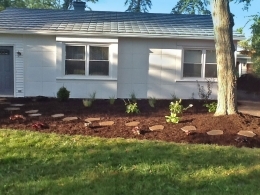 The result was a beautiful new landscape that will compliment the house and give the residence some needed privacy in the backyard. 55; A Garden Guy Landscaping always looks to find ways to include edible gardens into the landscape design. These gardens serve to not only provide the rewarding benefits of harvesting your own food, but to also seamlessly blend into the overall concept of the landscape. 60; The house that was described as the "smallest and blandest house in Lincolnshire" was asked to be made beautiful. The planting beds were extended and curved to soften the square appearance of the house. The variety of colors really pop against the white house. The backyard will mature to provide privacy and shade in their now beautiful and diverse landscape. 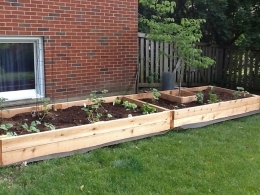 What is the best time to mulch? What type of residential clients do you work for? Who will work on my property? 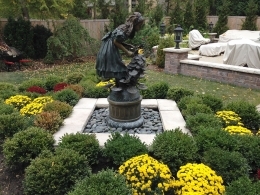 A Garden Guy Landscaping serves the following Chicago Area: Algonquin, Arlington Heights, Barrington, Barrington Hills, Bartlett, Bensenville, Buffalo Grove, Burr Ridge, Chicago, Deer Park, Deerfield, Des Plaines, Dundee, Elk Grove Village, Elmwood Park, Evanston, Franklin Park, Glencoe, Glenview, Harwood Heights, Highland Park, Hoffman Estates, Inverness, Kenilworth, Lake Forest, Lake Zurich, Libertyville, Long Grove, Maine Township, Morton Grove, Mount Prospect, Niles, Northbrook, Oak Park, Palatine, Park Ridge, River Forest, Riverside, Rolling Meadows, Rosemont, Roselle, Schaumburg, South Barrington, Sugar Grove, Vernon Hills, Wheeling, Wilmette, Winnetka, and more.